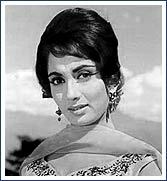 Best-tressed of the 1960s heroines, Sadhana was more than just that sophisti-cut fringe or the mascot of many a shot-in-colour-in-Kashmir musical. She was also an undervalued actress who bared her soul in two Bimal Roy films and was tantalisingly enigmatic in Woh Kaun Thi and Mera Saaya. She was a gamine, fragile beauty in the Audrey Hepburn-Leslie Caron mould (think Gigi) --- heart-breakingly waifish or heart-stoppingly glamorous. Sadhana once told me, "R K Nayyar [director of her debut Love In Simla], and later my husband said they loved my nose --- one could land a helicopter on it!" She added with characteristic candour, "I was attractive but never beautiful." Lyricists begged to differ. As the burkha-clad beauty Husna in Mere Mehboob, she inspired Shakeel Badayuni to compose Mere mehboob tujhe meri mohabbat ki kasam/ Phir mujhe un nargisi aankhon ka sahara de de. Hasrat Jaipuri showered epithets like Nargis-e-mastaana and Phoolon ki rani, baharon ki malika on her in Arzoo. Sadhana Shivdasani's trek to stardom began when her family fled Karachi during the post-Partition riots and set up residence in the barracks near Sion, Mumbai. The Shivdasanis saw difficult times but indulged Sadhana, named after the famed actress, Sadhana Bose, in her choice pastimes --- eating golas and watching films, especially those starring her favourites, Dev Anand and Nutan. Thanks to actor-cousin brother, Hari Shivdasani (actress Babita's father), Sadhana, too, was drawn to the profession. A teenaged Sadhana faced the camera as a chorus girl in Raj Kapoor's Shri 420 (1955). An Arts undergraduate at Jai Hind college, Sadhana was approached to play second lead to heroine Sheila Ramani in the first Sindhi film, Abana (1958). When Sadhana asked her for an autograph, Sheila scribbled, "One day I will come and ask you for your autograph." Sheila Ramani was the first to recognise the future trajectory of Sadhana's career. Sadhana's big break came when an advertisement of Abana caught movie biggie Sashadhar Mukherjee's eye. He enrolled Sadhana at his acting school, where Asha Parekh occasionally frequented. He gave Nasir Hussain the choice of either Asha Parekh or Sadhana. Nasir chose Asha. But Mukherjee wanted to start another film, too, for which debut-making director, R K Nayyar, who had assisted Raj Kapoor, chose Sadhana. He teamed her with Mukherjee's son Joy and cooked up a light, sweet confection, Love In Simla (1960). Nayyar and Sadhana fell in love during the making of this film; the audience fell in love with Sadhana after the film was released. In this Cinderella rework, plain Jane (Sadhana) transforms into a svelte swan to compete with her conventionally pretty cousin (Azra) and vie for Joy Mukherjee's affections. Sadhana was a scene-stealer with her near-naturalness before the camera and became the darling of the teen set. The craze for her Audrey Hepburn-inspired 'Sadhana fringe' (suggested by Nayyar to conceal her broad forehead) spread, making her the fashion icon of her age. Three months later, Sadhana's second film, Bimal Roy's Parakh, showed her as the soul of unaffected simplicity. Roy cast her in his next directorial venture, Prem Patra, too. Bound by a three-year contract with Mukherjee's banner, Filmalaya ("I was paid Rs 750 a month for the first year, Rs 1,500 a month for the second year and Rs 3,000 a month for the third year"), she starred in Filmalaya's musical, Ek Musafir Ek Haseena, one of the earliest road stories with lilting songs. Sadhana tranformed from popular ingenue to huge star with the success of the Muslim social, Mere Mehboob (1963). On the first day of shooting, director H S Rawail insisted that she keep her famous fringe as part of her get-up. His foresight paid off. In her first colour film, Sadhana looked terrific under G Singh's careful cinematography. Actor Danny Denzongpa once described the visage of Sadhana in a burkha with just her eyes visible in Mere Mehboob as "unforgettable." For a short but memorable period, Sadhana enjoyed the view from the top. In the 1960s, she had only 19 releases, 11 of which were hits. There was the successful Woh Kaun Thi and Rajkumar (1964). Both her 1965 releases were blockbusters --- Ramanand Sagar's Arzoo reteamed her with Rajendra Kumar; while Yash Chopra's Waqt had Raaj Kumar and Sunil Dutt vying for Sadhana's affections. In Waqt, she successfully pioneered the tight churidar-kurtas and made a much-imitated fashion statement. Sadhana did more than set fashion trends. Inspired by her seductive smile, evocative eyes and her will-o'-the-wisp voice (Rekha once told me she adored Sadhana's voice), Raj Khosla helmed a one-of-its-kind trilogy of heroine-oriented mystery thrillers for Sadhana --- Woh Kaun Thi (1964), Mera Saaya (1966) and Anita (1967). Madan Mohan's melodies of Woh Kaun Thi and Mera Saaya are an integral part of Lata Mangeshkar's stage repertoire. Among all her successful heroine-oriented films, Mera Saaya was her tour de force. In a well-delineated double role, Sadhana portrayed the identity crises dogging the lives of twin sisters. The mischief in her eyes as one sister is carefully contrasted with the other sister's desperate anguish as a wife whose husband refuses to believe her. Incidentally, her mother strongly disapproved of Sadhana's boyfriend, Nayyar, often asking her daughter to marry "someone like Rajendra Kumar". But in 1966, aided by her father, Sadhana tied the knot with R K Nayyar. It was the best of times. It was the worst of times. A lingering thyroid problem aggravated, even affected, those much-admired eyes. Filmmakers turned their eyes toward fresher pastures. H S Rawail, who had once waited for months to ensure that Sadhana was part of Mere Mehboob, replaced her with Vyjayanthimala Bali in Sunghursh (opposite Dilip Kumar), while producer Pacchi chose budding star Rajshree to play Sadhana's role in Around The World (opposite Raj Kapoor). A spunky Sadhana underwent a prolonged treatment at the Leigh clinic in Boston. She returned and threw a party for the who's who of the industry to announce that all was well with her. For a while it looked like she could pull it off. In 1969, two of her silver jubilees, Intequam and Ek Phool Do Mali, were released within a month of each other. Both were fuelled by Sadhana's star power. But offers gradually diminished. Reluctant to essay character roles --- Raj Kapoor is said to have offered her the role of Rishi Kapoor's mother in Bobby --- Sadhana finally accepted the transient nature of stardom gracefully and eased out after Geeta Mera Naam (1974). Then, after two decades of a tempestuous marriage that settled down to an even keel, husband R K Nayyar succumbed to an asthma attack. Sadhana, who had no children, was left alone. She keeps herself busy playing cards with friends at Mumbai's Otters Club, watching television and gardening. In keeping with her enigmatic image, she adamantly refuses to let herself be photographed in public. She once told me, "I am the kind of person who loves being by myself. I do have regrets --- losing my baby was one of them --- but no rancour. I don't hanker for the spotlight. I want my fans to remember me as the Sadhana of Love In Simla, Mere Mehboob, Woh Kaun Thi and Arzoo."